This brings a whole new meaning to EDM. Sort of serves as a spiritual sequel to 2009’s House Disney. A shame they never did a Trance Disney while the trance boom was still in effect in Japan. Visit the official website for more info. 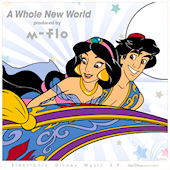 You can also grab the new remix of “A Whole New World” off iTunes Japan.